Any medievalist who has read Walter Scott’s Ivanhoe (1819) can attest to a strange experience. The novel depicts a twelfth-century English society riven by the legacy of the Norman Conquest (1066). The old chestnuts of nineteenth-century medievalism–language as identity, history as racial conflict, oral poetry as political protest–are all already here, but expressed by characters named Wamba, Athelstane, Reginald Front-de-Bœuf. It is disorienting to encounter zombie ideas in a novel that predates the hiring of the first professor of English literature, in 1828. Ted Underwood’s book is not on most medievalists’ radar. It is a literary and institutional history centered on the early nineteenth century. Yet its arguments about the formation of English studies return again and again to the teaching and literary representation of the Middle Ages. More even than its author indicates, this book demonstrates the foundational importance of medievalism to the discipline of English. My first book, English Alliterative Verse: Poetic Tradition and Literary History, is published by Cambridge University Press (2016). English Alliterative Verse tells the story of the medieval poetic tradition that includes Beowulf, Piers Plowman, and Sir Gawain and the Green Knight, stretching from the eighth century, when English poetry first appeared in manuscripts, to the sixteenth century, when alliterative poetry ceased to be composed. The book draws on the study of meter to challenge the traditional division of medieval English literary history into ‘Old English’ and ‘Middle English’ periods. The two halves of the alliterative tradition, divided by the Norman Conquest of 1066, have been studied separately since the nineteenth century; this book uses the history of metrical form and its cultural meanings to bring the two halves back together. 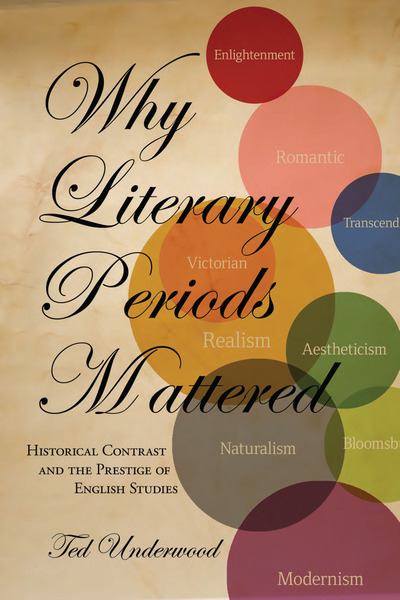 In combining literary history and metrical description into a new kind of history called ‘verse history,’ English Alliterative Verse reimagines the historical study of poetics. Individual chapters consider (1) Beowulf; (2) prologues to Old English poetry; (3) Lawman’s Brut, an alliterative verse chronicle of the twelfth century; (4) prologues to Middle English poetry; (5) St. Erkenwald, an alliterative romance of the fourteenth or fifteenth century; and (6) the alliterative tradition in the sixteenth century. A version of Chapter 3 appears in an edited volume devoted to Lawman’s Brut. I have also edited two late fifteenth-century alliterative poems, The Ireland Prophecy (Studies in Philology) and The Vision of William Banastre (in an edited volume devoted to early English poetics), and I have brought to light two sixteenth-century excerpts from Piers Plowman (Review of English Studies). These new texts inform the arguments of Chapter 6. Four articles bring the arguments and methods of the book to related topics: the relationship between metrical history and language history (Modern Philology); the meter of Piers Plowman (Yearbook of Langland Studies); the history of modern scholarship on medieval verse (ELH); and the historical study of poetics (Modern Language Quarterly).